Do you have a Secret Admirer? Click here to play! Well, start playing this slot today and you certainly will. There is nothing better than enjoying the gifts of an admirer, and this fun slot has all that and more for the right combinations! 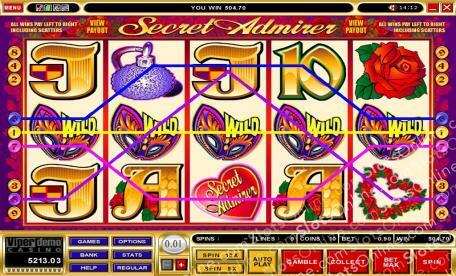 Secret Admirer is a wonderful 5-reel slot played across 9 pay lines. Whenever you win, you will be offered the chance to Gamble your winnings for double or triple the payout! The Mask is Wild and can be substituted for any other symbol except Scatters. Spin up all five on an active pay line and you will win yourself up to 5000 times your wager. The Diamond Ring is Scattered and if two or more appear anywhere on the reels you will win a cash prize, up to 50 coins! Your Secret Admirer awaits at this tantalizing slot, so head on down and win yourself some brilliant prizes today. The Diamond Ring is Scattered and can appear anywhere on the reels. Spin up two or more for a cash payout. The Mask is Wild and can be substituted for any other symbol on the reels except Scatters. Up to 5000 coins can be won on active pay line combos.